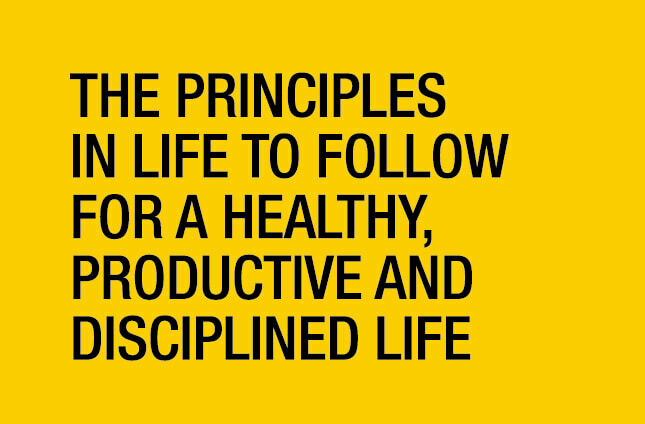 The Principles in Life to follow for a Healthy, Productive and Disciplined Life. Based on research conducted by Sheikh Fares Al Mustafa, Imam and Preacher at the Al Farooq Omar Bin Al Khattab Mosque and Centre. The law of the Lord in the everyday life. God created the man, a superior to all other beings. He gave him the ability to think, to know what is right and wrong. He created everything under his disposal to benefit from and enjoy. And He has subjected to you whatever is in the heavens and whatever is on the earth - all from Him. I am often asked about the secret of success, and my response is very simple. I follow ‘The Constitution of God’. I urge people from Arab nations to take time to reflect on what is really important in life, and adopt these very simple rules set out to us by God. People who follow God’s will are disciplined and have a clear path to follow. As human beings we were all created equal; we were gifted with a mind to think, a heart to feel and a body to move. And each of these gifts need to be nurtured and cared for, otherwise we are wasting our precious gift of life from God. There are some seven billion people sharing our world of different races, colours, religions and ethnic backgrounds, and I believe we can be categorised into two types – not more. First, there are those that uphold God’s law, who follow the rules and enjoy a happy existence and secure their place in Heaven. The others are those who feed off the world and take all the earthly pleasures available while neglecting the teaching of God’s Constitution. These are people who have no faith, no direction, and ignore God’s will and mistreat fellow human beings. God’s Constitution is clear in His Holy Koran and in the religion of Islam, and those who choose to follow it are winners both in life and death. He has produced you from the earth and settled you in it. God created this beautiful, diverse and resource-rich world for His worshippers to populate it, build and make it flourish and prosper. We must sustain God’s creation, not destroy it. Man’s mission on earth is to work hard and responsibly. We are all prone to temptation, but it is important to be strong and have the will power and faith to stay on the right path. We must turn our backs on laziness, sluggishness and apathy. If we do that, then we will see the fruit that it bears. And sent down upon you from the sky, rain by which to purify you. For earth to flourish we need to be strong mentally and physically. One of the biggest failings I see so often is the weakness in people’s character. To have a strong mind and body you need to keep it clean, clear and free from substances. Health is in the hands of the creator, but it is the responsibility of the individual to protect their own body, to keep it clean, pure and healthy. This means that everything that passes our lips should be for the benefit of our body, we need to eat well and exercise to remain strong. The Prophet Mohammed (PBUH) in the Hadith encouraged better hygiene and the preservation of the health: “dress well and trim your nails”. Religion encourages believers to be strong. A weak believer cannot create positive change and doesn’t have a beneficial impact on his community. A strong believer is someone who can lead, and be a good role model for others to follow. In the Hadith, it is said that “a strong believer is dearer to God than the weaker believer”. The strong, healthy believer doesn’t like laziness, he is someone who works hard, with energy and a perseverance to succeed that will not relent. But this requires a healthy mind and body. One of the Prophet’s morning prayers sites: “O Allah, I seek refuge in You from worry and sorrow, and I seek refuge in You from disability and laziness, and I seek refuge in You from cowardice and miserliness”. This prayer is self-explanatory about how much God and his Prophet despised laziness and cowardice. And [We] made your sleep [a means for] rest, and made the night as clothing, and made the day for livelihood. Islam teaches us to start the day earlier with prayer. The Prophet (PBUH) also set the example to wake up early when he sent his armies out for invasions. They would set off at the crack of dawn. Starting the day early has been proven time and time again to make us more productive and less distracted. Staying up late, unless it is necessary for the livelihood of a person, harms the body and the mind. In a world that revolves around a 24 hour clock, sometimes this is not possible. Nonetheless it is important to ensure your body is rested and gets enough sleep. Sleeping at night is a blessing by God and a requirement; it inspires internal peace, rests the mind and the body and revitalises it for the next day. Those who rise earlier not only reap spiritual rewards but also achieve more in the day. Those who say up late are subjecting themselves to health risks. Sleep deprivation weakens the body’s immune system, affects the vitality and energy levels, appearance, and impacts the cognitive process resulting in memory loss. A study conducted by an Italian university shows that the lack of sleep causes high blood pressure, and could lead to heart attacks. Another study by Stanford University in California, led by Dr D. Manuel, shows that lack of sleep leads to weight gain. It is also important to strike a balance between work and rest. And eat and drink, but be not excessive. Indeed, He likes not those who commit excess. One of the main principles of good health is a balanced diet which provides us with all the nutrients our body needs. In this day and age we have so much available to us, yet we still make the wrong choices. For our organs to function well we must fill ourselves with proper nutrients, not empty calories. “O Allah, I seek refuge in You from poverty”, Prophet Mohammed has said. God encourages people to benefit from the Earth’s goods and to work and prosper. Those who proclaim abstinence for the sake of belief are not appreciated because they are not reaping the benefits that God gave them. We are God's worshippers, entrusted by Him with time and opportunities, abilities and possessions, and the blessings of the earth and its resources. We are responsible to Him for their proper use. Materialism doesn’t make people happy, helping mankind does. There is a saying that money is the root of all evil. I disagree. It is the way a person choses to spend their money is where the difference between right and wrong comes into the picture. If a person grasp the opportunities given to him, works hard and reaps the financial rewards then that is great. It means he has more power to provide for his family and help others. Zakat is one of the five pillars of Islam. It is a mandatory duty for all Muslims to give a percentage of their money to those less fortunate than ourselves. One seventh of the world’s population today lives below the poverty line, earning less than $1.25 per day. Poverty is not something to be ashamed of, or something to despise. It is time each and every one of us play a part in eradicating poverty.